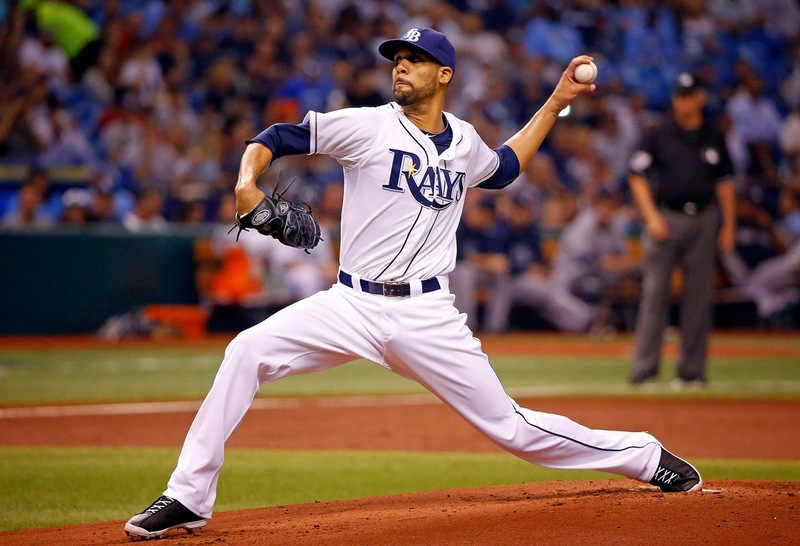 Tampa Bay's ace David Price will lead my World Series pick. The new baseball season is suddenly upon us. Things are slated to begin a bit earlier than usual this year as the Dodgers and Diamondbacks will play the opening games of the regular season this weekend on the other side of the planet in Australia. Following that, Spring Training will awkwardly continue for another week before the rest of the teams kick off their season. Here in Austin, I'll spend the next week or so hastily packing up to move into a new apartment with my girlfriend. Should be an exciting, hectic, and memorable time which will be almost immediately followed by a two-week trip to the Iberian Peninsula. All of which is to say: I don't quite have the time to write as thorough an MLB preview as I had been doing for the previous 4 years. So I'll keep things as brief as I can this time around. As always, I will use the season projections provided by Baseball Prospectus' PECOTA system as a baseline and determine whether I think each team will finish above or below that baseline. These predictions are not all that serious, I wouldn't bet on most of them (the last four years my success rate is below 40% with plenty of embarrassing misses) since the 162-game season provides immense opportunity for variance, injuries, sudden breakouts or collapses, and every other kind of unforeseen event. But I'm a certified baseball addict with opinions about everything and what better place to share them than here? Without further ado, here are my predictions for the 2014 baseball season. New additions Shin-Soo Choo and Prince Fielder are perfect fits. This team was sorely lacking in left-handed hitters as their scoring fell precipitously last year. Choo is an on-base machine and Fielder may blast 50 homeruns. I've also got high hopes for Jurickson Profar now that he'll be granted a full-time role. A reinvigorated offense makes up for a pitching rotation that consists of strikeout machine Yu Darvish and a whole lotta fluff. With a lineup that relies on depth and flexibility, projection systems will rarely peg them to be any good. But the A's are coming off two consecutive division titles, the core remains intact (with Josh Reddick and Yoenis Cespedes as bounceback candidates), and they stocked up on shut-down relievers to fortify an already deep bullpen. Having lost two of last year's pitching stalwarts, Jarrod Parker (to Tommy John surgery) and Bartolo Colon (to the Mets), Billy Beane & co will need to get creative starter-wise but that's what makes this team so fun to follow. Coming off a highly disappointing season in which they sunk below .500 despite fielding the game's best player, Mike Trout, flanked by high-priced vets Albert Pujols and Josh Hamilton, the Angels are actually projected to win the division this year by both PECOTA and FanGraphs' system. While they patched up their horrendous starting rotation with two solid young lefty hurlers Tyler Skaggs and Hector Santiago, this is still a very flawed team. They ought to get over the .500 mark but anything beyond that will be shocking. They threw a bunch of money at Robinson Cano but the lackadaisical superstar will hardly be enough to drag this team back to respectability. They got not one but two Cy Young-caliber performances out of their pitching staff last year with Japanese import Hisashi Iwakuma (2.66 ERA, 1.01 WHIP in 219.2 innings) arguably outpitching the perennially dominant King Felix Hernandez (3.04 ERA, 1.13 WHIP in 204.1 innings), yet they still allowed 754 runs as a team, 4th worst in the league. PECOTA sees that number dropping down to 691 runs allowed, thus the optimistic projection, but that seems unlikely. The won 51 games last year, so can they make a 15-win jump? Nope. Dexter Fowler was a nice little pickup and highly promising outfield prospect George Springer (37 homers, 45 steals in the minors last year) should be the first arrival this season out of a deep farm system. The overall outlook in 2014, though, is further misery for the DisAstros. We haven't seen a fielder as flashy, sure-handed, and creative as shortstop Jose Iglesias in a long time and now, sadly, he's gone for the year with fractures in both shins. It's a tough loss for the Tigers and opens up a sizable hole defensively for a team intent on going back to the World Series, but they'll still be pretty damn good. Plenty of punch offensively (look for a big year from rookie 3B Nick Castellanos) and still the best rotation in the AL, with a reinforced bullpen. They remain the division favorites for the 4th year in a row. Most prognosticators are picking the same boring division winners (witness the recently released Baseball Prospectus staff picks for such lack of variety) with the Tigers being near universal favorites, just as they've been the last few years. I badly want to break from that by picking the Indians to win this division. But they don't look quite good enough. It's a solid team all-around with some slight improvements from last year (removing shaky receiver Carlos Santana from behind the plate, plugging Danny Salazar into the rotation full-time, adding David Murphy to form a perfect platoon with Ryan Raburn), but I don't think they've got enough to overcome Detroit's star power. I'm going against the tide with this one. The White Sox were absolutely atrocious last year (99 losses, last in the league in runs) and look like a rebuilding team this year. Call me crazy but I think they might finish above or around .500. The rotation looks surprisingly solid, led by gangly superstar southpaw Chris Sale with no major scrubs behind him. The lineup is typical White Sox: barely any OBP but tons of power. Adam Eaton could be a leadoff sparkplug, new Cuban first baseman Jose Abreu looks like a legitimate slugger, and both Avisail Garcia and Matt Davidson (each 22 years old) offer some upside. I could also see this being a scenario where Sale and Abreu have nice seasons but the team still tanks. I'll go with the upside. Norichika Aoki fits nicely into their lineup, Mike Moustakas might finally start hitting, and I love Salvy Perez, but this is the Royals. Ned Yost is the manager. I find it hard to have any confidence in this team. I expect a huge regression from last year's league-leading pitching (though the defense still looks great) and maybe a stupid trade from Dayton Moore out of desperation. The last three years they've won 63, 66, and 66 games. Adding players like Phil Hughes, Ricky Nolasco, and Kurt Suzuki won't do much to change that pattern. The game's undisputed #1 prospect Byron Buxton is waiting in the wings and will eventually make this team watchable, but for now they stink. As it so often does, this division looks very hard to predict. Aside from the Blue Jays, any one of these teams could potentially be on top. Not much separates them on paper. What will probably separate them in reality is uncontrollable events like injuries. The Yankees look stacked, but they may also be the most susceptible to injury with plenty of old players on hand. The Red Sox were pretty lucky injury-wise last year and played a full 7 months of baseball, so they could fall apart, too. Let's make this perfectly clear: I hate the Yankees. I actively root against the Yankees and dislike everything about them. And yet, while many prognosticators and projection systems are pessimistic about this team, I see the additions of Brian McCann, Jacoby Ellsbury, Carlos Beltran, Masahiro Tanaka, and even Michael Pineda (who finally looks healthy and has pitched well in Spring Training) as being more than enough to lift this team back to contender status. The entire infield is one giant injury risk, Beltran and Ellsbury tend to get hurt a lot, and they've lost two key players in Robinson Cano and Mariano Rivera, but I still foresee this being a strong Yankee team. As much as I hate to admit it. Perfect candidates for regression, they had some outstanding seasons all across the roster and didn't even have any major injury issues aside from losing late-inning relievers Andrew Bailey and Joel Hanrahan (more than adequately balanced out by the emergence of Koji Uehara). I love rookie shortstop Xander Bogaerts and have high expectations for him; Grady Sizemore returning to a productive major league career would be a great story and I'm rooting for him; it's hard not to like Papi and Pedroia. Lots to like here, but I expect the Sox to fall back to earth nonetheless. Much like the Cleveland Indians, I badly want to pick the O's to overtake the prohibitive favorites here so I can break from the pack a little. They've got a great core of talented young hitters in Adam Jones, Chris Davis, Matt Wieters, and Manny Machado, they bulked up a bit through free agency by adding Nelson Cruz and Ubaldo Jimenez. I want them to do good. They're a fun team and Buck Showalter seems like a great manager. Then I look at their gaping hole at second base (Ryan Flaherty? Jemile Weeks? Jonathan Schoop?) and consider that the rotation's most optimistic outlook is to reach mediocrity and realize they'll have a steep uphill climb to come anywhere near contention in this division. Considering last year was an unmitigated disaster, they've got nowhere to go but up. If Jose Reyes stays on the field, this offense can be explosive and easily make it back over .500. The pitching staff bogs them down no matter what, though. They stunk last year and already lead all of baseball in walks through Spring Training.